Spend a day on the water with Greg Bohn, considered one of Wisconsin's Top Walleye Guides. Over 4-Decades of full time guide experience fishing Vilas & Oneida County lakes & flowages. Fully licensed & insured Ranger 618T Boat, powered by Yamaha 90 H.P. 4/Stroke outboard, Lowrance electronics & Minn Kota Vantage motor. The heart of any guided fishing trip is the knowledge & experience of your guide. Greg Bohn has guided thousands of clients and has assembled over 40/yrs of walleye, crappie & musky catching savvy. Considered by many one of the finest walleye guides to ever cut a path through the Wisconsin Northwoods. 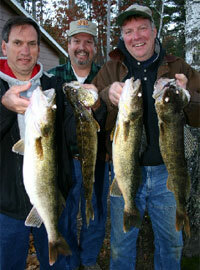 Kick back & enjoy walleye fishing on one of over 350 Northern Wisconsin lakes & flowages. Greg will personally instruct you on the latest guide secrets and art of catching walleye! Lake Selections * Seasonal Walleye Patterns * Jigging Techniques * Mr. Slip Bobber Secrets * Lowrance Electronics * Weed Walleye * Wood Walleye * Vertical Jigging * Minn-Kota Boat Control * Flowage Walleye * Live Bait Rigging * Float Selection AND MUCH MUCH MORE!!! ON'T FORGET ITEMS ON CHECKLIST! Lodging & Motel Pickup ~ Right at Your Door! Guide Trip Deposit Required: A $175.00 deposit in advance is required to hold reservations. Send Checks payable to Strictly Walleye Guide Service 6087 Hwy 51 South Hazelhurst, WI 54531. Hey' Let's Go Fishing! 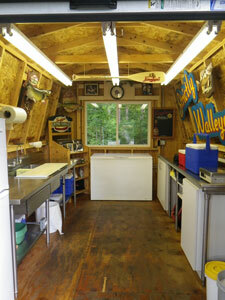 Strictly Walleye Guided Fishing Trips Include Free customer fish cleaning & freezing services. Fishing tackle is provided upon request. Lodging & Motel Pickup Available Right at Your Door!